Will the Mo-bot win the 10,000? 1. Looking for someone to follow on Twitter? That person is Tim Layden @SITimLayden. He is churning out great, nuanced stuff on track and field as it happens. His interview with the head timer of the Felix/Tarmoh heat became part of the story, as after Tarmoh read it, her attitude towards the run off changed. 2. After watching a few days of Olympic swimming, I am always impressed with both the similarities and differences between swimming and running. First, in swimming, time is always important. Final fields are determined strictly on time, and it's possible to win a preliminary heat but not advance to the final. This means that swimmers must swim close to a full effort in every heat. If runners were required to do this, they would be destroyed by the heats, as it would be impossible to recover from a series of close to 100% efforts. Relatedly, another difference between swimming and track is the literally unbelievable (at least from a running perspective) ability of these athletes to recover. Last night, Missy Franklin won the 100m backstroke, breaking the American and Olympic records, only 10 minutes after racing in the 200m free. The 200m freestyle takes roughly as long as an 800m running event, and it would be impossible to imagine coming back 10 minutes after a world class 800m to perform at an elite level. I'm not sure what this means -- but here are two hunches. First, the amount of time swimmers spend training is tremendous, and this must be related to their ability to recover. We runners know that reduced recovery times are one of the benefits of high mileage. 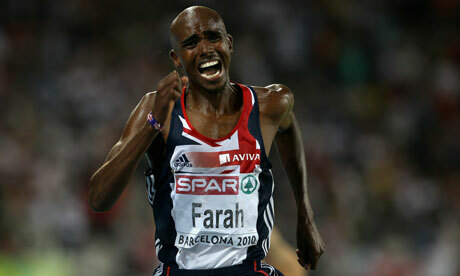 Second, it also shows the extent to which running is not only an endurance sport but an impact sport. So much of what we deal with in running is a matter of balancing a high volume of training with reducing the impact of training. Alter-G, anyone? This suggests that most runners could benefit from some form of cross-training that reduces impact. Tactics. Watching swimming reminds me just how important the tactical nature of track running is. This is easy to forget for us hobbyjoggers who get pulled into chasing PRs. At the top levels of the sport, track is not about time, but about competition. This is something that I hope NBC understands and attempts to portray in their coverage. Track racing is all about rhythm and disruptions of rhythm, surging, positioning, kicking. In swimming, at least to these layman's eyes, the winner of the race is always the fittest. In track this is not always the case. Bodies. One thing that is striking about the Olympics is the wide variety of athletic bodies. Swimming bodies are so different from running bodies. Theirs are--for the most part--heavy, flexible, powerful, undulating. In this way, they mirror the medium in which they do their work. Runners' bodies are stiff and angular, and to my eye they always betray the fact that runners tread line a thin line between injury and health. They are simultaneously strong and fragile. Swimmers just look strong. 3. My achilles tendons get sore just watching these gymnasts. Holy tendinitis, batman! 4. I find myself embracing my Americanism more than ever in these games. Usually the nationalism of the Olympics is a turn-off, but I am so excited by the current field of American distance runners that I am putting my snooty cosmopolitanism to the side and cheering lustily for our American side. Cool side note: cheering American these days is pretty compatible with liberal cosmopolitanism: Go Lagat! Go Shalane! Go Lomong! Go Rupp! Go Uceny! Go Leo! Click on this picture to enlarge and check out the veins in Rupp's legs. 5. This brings me to the opening ceremony. I loved it. To me, it was a long commentary on the blending of cosmopolitanism and place that is characteristic of the 21st century. Seems to me that Danny Boyle was making the point that what is unique about London is what it has in common with the rest of the world, that is, it has a long local history that leads into and funds and puts special twists on the way in which globalization happens there. I thought the lighting of the torch was simply spectacular and consistent with the theme. Instead of looking backwards to a provincial hero like Bannister, it looked forwards and outwards, with the yet-to-be-known young athletes setting off many torches. He gave us a symbol of the sort of unity that the 21st century is aiming towards: that unity in difference, a world that comes together through accretion and spontaneous connection, but is no less together. Cool stuff. And even cooler since folks from the British Isles like Shakespeare and Joyce and Hobbes and Locke and Hume have been pointing in that direction for centuries. 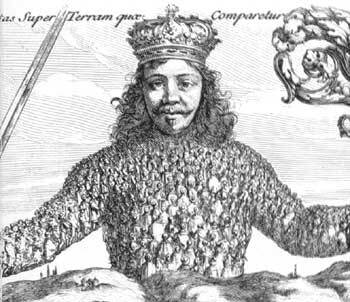 Hobbes' depiction of the Leviathan shows a state in which individuals are still individual. 6. Drugs/Technology/Cheating. Beneath and behind all of these great performances will always lie a dark specter. When seeking efforts and accomplishments that are too good to be true, we will find efforts and performances that turn out to be too good to be true. It's unavoidable. What should the appropriate response to cheating in the Olympics be for the 21st century fan? I think we need to avoid extremes of judgment. We can't let our cynicism about cheating prevent us from being truly inspired by the performances that we see. On the other hand, we can't let our desire for cheap inspiration cause us to turn a blind eye to the things that threaten the health of athletes, the field of fair play, and the spirit of open and friendly competition that is what we love about sport. To me the greatest travesty of doping is that it undermines the simple idea that sport promulgates: our competitive struggle against each other can, when done the right way, lead to greater things than individual glory. What makes cheating wrong is not simply that it breaks established rules. It's that it doesn't respect the reciprocity of competition. It's that reciprocity and the equality that it entails that makes winning meaningful. After all, if the participants in a contest are not equally matched, winning is not winning at all -- it is simply the bald exercise of power. It's a great time to be a track fan.
" After all, if the participants in a contest are not equally matched, winning is not winning at all -- it is simply the bald exercise of power." "Runners' bodies are stiff and angular, and to my eye they always betray the fact that runners tread line a thin line between injury and health. They are simultaneously strong and fragile. Swimmers just look strong"
Runners appear almost sickly in comparison. "I find myself embracing my Americanism more than ever in these games." - I'm reading this again now that the Oly's are over. (sniff, sniff). I embraced so many of the sports we forget about during the non olympic times. Bless those athletes that put it all on the line, in the pool, on the field or on the mats as they inspire and keep the dreams alive. Great post and Rupps legs...ridiculous! I get chills just thinking about some of those track races. Where do you find your pictures, comic, etc for your blog. I really enjoy them.